Monday Bible study group meets at Wesley at 10.30am, generally on alternate weeks. 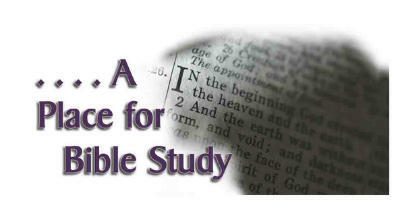 Tuesday evening Bible study group meets in members’ homes at 8.00pm on the first and third Tuesdays of the month. Current study is John's gospel. Wednesday Bible study group meets in members’ homes at 7.30pm on the second and fourth Wednesdays of the month. Thursday Bible teaching: interactive sessions to help us delve into the treasury of the Bible led by various members of the church. The current series is on John's Gospel. Meetings are at Wesley every week at 7.30pm for 8.00pm for an hour and include refreshments, music and worship.